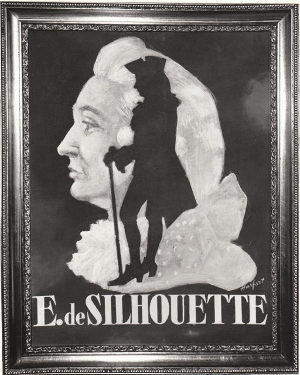 July 8 is the birthday of the pedantic, parsimonious, and publicly ridiculed Étienne de Silhouette (1709) whose legacy is but a shadow of his former life. Financing an expensive and unpopular foreign conflict has never been an easy task, and in mid-eighteenth-century France, it fell upon the namesake of those familiar black profile cut-outs—Étienne de Silhouette, the hapless and penny-pinching French Controller-General of Finances under Louis XV. Starting in 1754, France began waging the Seven Years’ War against England. Truth be told, the unpleasantness lasted ten years and was called the French and Indian War in North America and the War of the Conquest in French Canada—but no matter the name, it was an expensive proposition, and King Louis XV needed someone to pull off a monetary miracle. Much to the disgust of most of the French nobility, one of Louis’s chief advisors was his bouffanted mistress—Madame de Pompadour (see pompadour). After catching a free moment from appointing window treatments, she recommended her good friend Monsieur Silhouette to help reduce the skyrocketing deficit and replenish the French war chest. Born Born Étienne de Silhouette in 1709, the fifty-year-old financier seemed a strange choice to solve France’s fiscal concerns, as he had studied finance and economics in London and was an unapologetic Anglophile, having translated multiple works by Alexander Pope, Henry Bolingbroke, and William Warburton into French. But Madame de Pompadour had Louis XV’s ear, among other things, and was able to secure him the position of Controller-General in 1759. It is reported that he saved the French treasury 72 million francs in his first twenty-four hours in power—all at the expense of the rich and privileged. He almost immediately confirmed the worst fears of his noble detractors when he placed a land-tax on large estates and reduced the pensions of the wealthiest Frenchmen. One would think that all of this populism would have made him a hero among the hoi polloi, but cartoons and jokes began to abound at all levels of society poking fun at Silhouette’s hopeless attempts to overcome a crippling deficit. He began taxing all external signs of wealth—luxury goods, decorative windows and doors, servants, and farms. Unable to raise enough money through these new taxes, he then turned to the dining room and insisted that French gold and silver (especially the plates and tableware of Louis XV) be cast into the melting pot. This proved to be the last straw for his enemies, and Silhouette was finally forced to abandon his post after only eight months in office. Soon, any cheaply manufactured bauble was said to be made á la Silhouette (“according to Silhouette”), though his connection to the inexpensive art form is less clear. The foremost theory is that his name became synonymous with what the English at the time called “shades” simply because the paper profiles were a cheap alternative to the expensive portraits or sculptures commissioned by nobility. They thus became the preferred medium of a citizenry suffering under Silhouette’s heavy taxation. Despite this negative connotation, silhouettes spread to the new world and were hugely popular in America from 1790 to 1840, at which point they were overshadowed by the invention of the camera. They had a bit of a pop-culture renaissance in the 1950s through the opening credits of Alfred Hitchcock Presents and then the James Bond film series, finally cementing their caché of cool in the early iPod commercials. One competing theory surrounding Silhouette’s namesake is that he brought the association upon himself. After leaving office in disgrace in 1759, Silhouette quietly retired to his estate at Brie sur Marne and purportedly pursued one of his favorite pastimes—cutting out black paper profiles of his family—until his candle was extinguished in 1767.